Imagine a world where your debit card stays in your pocket at all times, and you never have to touch cash. This is a place where you don't have to remember your wallet, or even phone, when you run down to the corner store. It's a future well off in the distance, to be sure, but dozens of companies are taking the first steps to get there. You probably already know about payment systems like Google Wallet, which can use NFC technology to let you check out with the swipe of a smartphone. There are also services that use geo-fencing to register when you've walked into a store and when you walk out. The latest fad, however, doesn't require any extra equipment at all—at least none you'd be carrying around. You just need your face. It's a big, crazy step. But also one we have the tools to start working toward. At present, there's a small slew of companies using facial recognition software to handle all kinds of transactions. The work they're doing has the potential to completely change your daily life, and scare the underpants off of privacy advocates. But companies like Uniqul are mostly counting on the former. This Finnish start-up is on a mission with the stated purpose to create "the world's fastest payment system," and this week they launched a novel payments system based on facial recognition. The elephant in the room, of course, is whether stores are willing to make the massive investment in extravagant facial recognition equipment to use the service, and whether people are willing to let Uniqul file their face away in a database of customers. The basic premise behind Uniqul's checkout process is that you should never have to do anything but be yourself when paying for something. No wallet. No iPhone app. Just a smile—or a grimace depending on your mood. You just walk up to the register where a camera scans your face and matches it against the database. "In the background our algorithms are processing your biometrical data to find your account in our database as you are approaching the cashier," the company explained in a press release. "The whole transaction will be done in less than 5 seconds—the time it usually takes you to pull out your wallet." The only thing you have to do beyond that is tap OK on a screen. It's hard to look past the basic idea behind Uniqul's service and not wonder what you gain by paying with your face. On one hand, the pay-by-face method is fast and entirely effortless. Again, there's no need wave your smartphone at anything. But even that benefit is tenuous, since 1) you're going to need to carry around a debit card or cash for everywhere without a face-reading kiosk, and 2) is the 5-second transaction (assuming it goes smoothly) really do much for you over a 15-second swipe-and-PIN purchase? And on the other hand, the system would require an upfront investment from merchants so that they have the right face-scanning equipment in the store and software to support it. Beyond that, the privacy question lingers. Will people that aren't using the service feel comfortable in front of the face-scanner, even if it's not scanning their faces? Oh, and it's not free, either. Uniqul calculates fees based on physical space—from €0.99 a month for terminals in a one to two kilometer radius to €6.99 for global access—and it's entirely possible that you might end up paying for a service that you can only use in a couple of different location. Remember: Paying with your face is only fun when it works. There are other players here, of course. 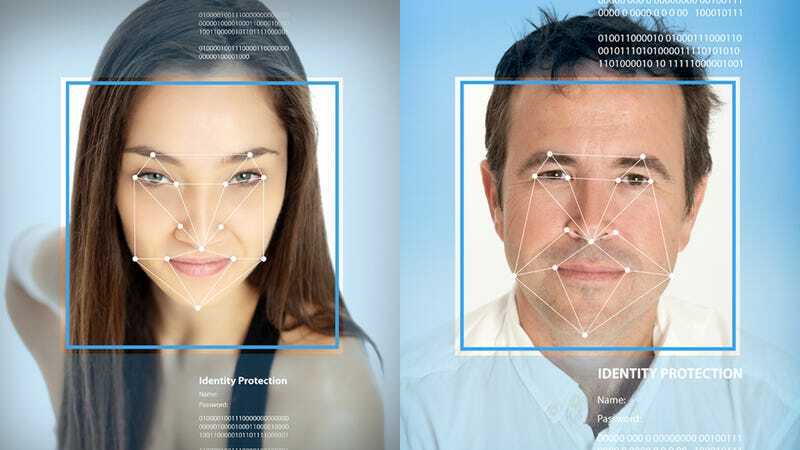 An American company called Diebold is taking that same facial recognition idea and applying it to ATMs. The benefit here has as much to do with security as it does with convenience. So this time, instead of walking into a shop and getting your face scanned, you walk up to an ATM machine and connect to the network with a QR code on your phone. Instead of typing in a pin, you simply step back for a face scan, and you're on your way to taking out cash. The Diebold machine is so plugged in, it doesn't even issue paper receipts. Instead you get a text. But again, plenty of people out there are very turned off by facial recognition software. You need only look as far as Facebook's huge screw up when it attempted to roll out facial recognition feature to make tagging photos easier. While many users protested, Germany declared the software to be straight up illegal. So that's one country that won't be enjoying a pay-by-face future. Otherwise, merchants and customers alike will have to invest time and energy to make the switch to virtual payments, regardless of whether it's by facial recognition, NFC or otherwise. There is another way, though. Ironically, plain old humans might be the best "facial recognition" tech out there. Square is arguably leading the way with its geo-fencing features (think of it as analog facial recognition). The new Square Wallet software syncs up your profile with a store's point-of-sale software so that the cashier knows who you are when you walk in based on—you guessed it—your face. The GPS and Wi-Fi chips in your phone help. And because the system registers your presence as soon as you walk into the store, it's possible to tailor a completely personalized shopping experience based on that individual customer's preferences.